How much doctrine is enough? | J.W. Wartick -"Always Have a Reason"
How much doctrine is enough? Hordern held an existentialistic view of faith and the Christian life. He made a sharp distinction between faith as trust and faith as belief in correct doctrine. He criticized the Protestant penchant for reducing salvation to ‘correct belief.’ (Murray, 119, cited below). The question might legitimately be asked, ‘Trust in what?’ While it is true that faith is not merely assent to true propositions, faith as trust must repose in the promises of God. There is a specific doctrinal content to the preaching of the Gospel, which engenders and calls forth trust in the heart… (Murray, 122). It seems to me that Murray’s response is compelling. If one wishes to reduce the Christian faith merely to trust in God; one may fairly ask which God one is trusting in. It seems that at least some doctrinal content is necessary for saving faith. The question may then be asked: how much doctrine is enough? My own answer to such difficult questions would be to fall back upon the grace of God. We do not know for certainty who shall be saved. But what we do know is that God is a just and loving God and will act according to God’s nature. It seems to me, moreover, that there is great importance also in what one hears and rejects. What are your thoughts on these tough questions? Let me know in the comments, below! *The third use of the Law may be defined as: that which “gives direction for the impulses of the Christian to do good works” (Murray, 14, cited below). 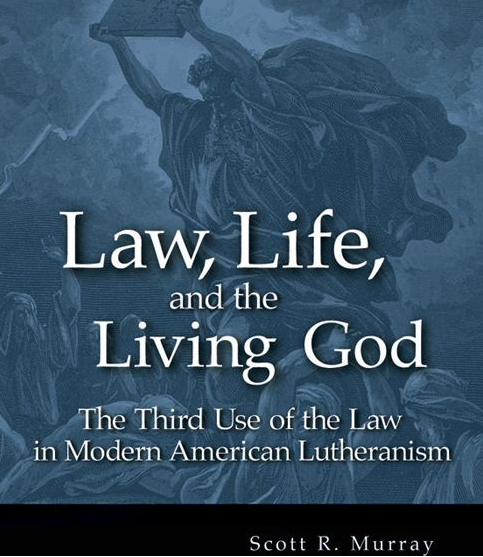 Scott Murray, Law, Life, and the Living God: The Third Use of Law in Modern American Lutheranism (St. Louis, MO: Concordia Publishing House, 2002. « Sunday Quote!- Beauty of Creation? I battled with this question a few years ago. What are the essential beliefs one must hold to be considered a Christian? I narrowed the list of “essentials” (doesn’t mean others aren’t important) down to four: 1) God exists (kind of hard to be a Christian and still be an unrepentant atheist); 2) The sinfulness of man (kind of hard to admit the need for salvation if one doesn’t think they have fallen); 3) the death of Jesus as payment for one’s sin debt (without this, there is no hope our sinful nature can ever be redeemed); and 4) the bodily resurrection of Jesus (without this, the purpose of his dying is invalid). As Paul wrote, if Christ has not risen, then our faith is in vain, and we are still in our sins (1 Cor. 15). This may seem like an overly simplistic list, but whenever I try to witness to an unbeliever, these really are the four things I think they need to be convinced about. I think you’re right in the broad sense that those beliefs are essential to the Christian faith (though I’m not sure on the wording of (3)), but I think there needs to be some balance as well. As I point out in this post, I think there is a fine line here and it is hard to know where it might be crossed. I appreciate your own insight, it is along the lines of what I was thinking as well. However, I think we need to be aware–as a friend of mine pointed out–that some yeast works into the whole dough (Galatians 5:9) and this might give us caution when it comes to false (or lack of any) doctrines as part of a set of beliefs. I’m not saying one has to have 100% perfect doctrine–surely that is impossible for we humans–but there seems to be a need to go beyond the essentials as well.